Welcome to CPAC's live online coverage of the 2013 Liberal Leadership National Showcase. 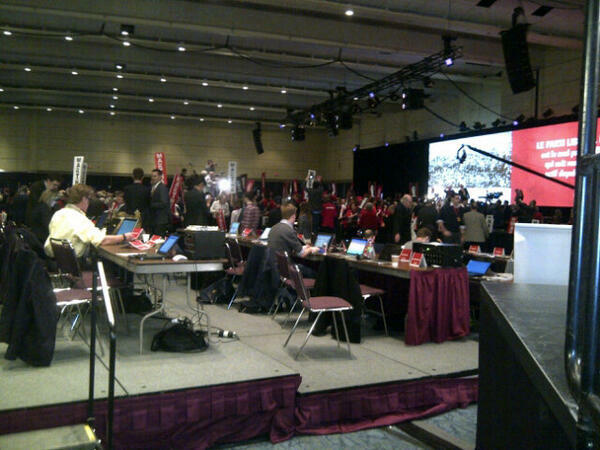 Our team is at the Metro Toronto Convention Centre as the party chooses its 10th permanent leader since 1887. Today begins with a tribute to interim leader Bob Rae, followed by speeches (approx. 1:30pm ET) from the six candidates: Martin Cauchon, Deborah Coyne, Martha Hall Findlay, Karen McCrimmon, Joyce Murray, and Justin Trudeau. Watch on-air at 12pm ET / 9am PT. This @liberal_party race on @CPAC_TV is joke. Come on @bobraeMP, let's be realistic! The official proceedings begin at about 1pm ET / 10am PT. Following the national anthem is the welcome by co-chairs Christine Innes (former federal candidate in Trinity-Spadina, Ont.) and Francis Scarpaleggia (MP for Lac-Saint-Louis, Que.). There’s an aboriginal blessing, followed by remarks by Paul Martin to begin the tribute to outgoing interim leader Bob Rae. Les procédures débuteront officiellement vers 13 h HE/10 h HP. Après l’hymne national, c’est l’accueil par les coprésidents Christine Innes (ex-candidate libérale fédérale dans Trinity-Spadina, en Ont.) et Francis Scarpaleggia (député du Lac-Saint-Louis, au Qc). Il y a une bénédiction autochtone, suivie d’une allocution de Paul Martin pour commencer l’hommage au chef intérimaire sortant Bob Rae. Biggest noise inside the room so far as Justin Trudeau makes his entrance. Trudeau now followed into the room by the Martha Hall Findlay team. Attack ads don't work...Harper afraid of '...engaged, empowered, active citizens"
by-election on March 25th (watch at 14:00). conservateurs une circonscription à la fois. Les principaux articles de son programme comprennent les droits des femmes, l’économie numérique, la viabilité et une plus grande représentation proportionnelle à la Chambre des communes. Murray's intro video includes support from former foreign affairs minister Lloyd Axworthy, David Suzuki, Kingston and the Islands MP Ted Hsu, and independent MP Bruce Hyer. Frm Cab Min Lloyd Axworthy says beware a coronation of leader and hopes party has learned from mistakes. 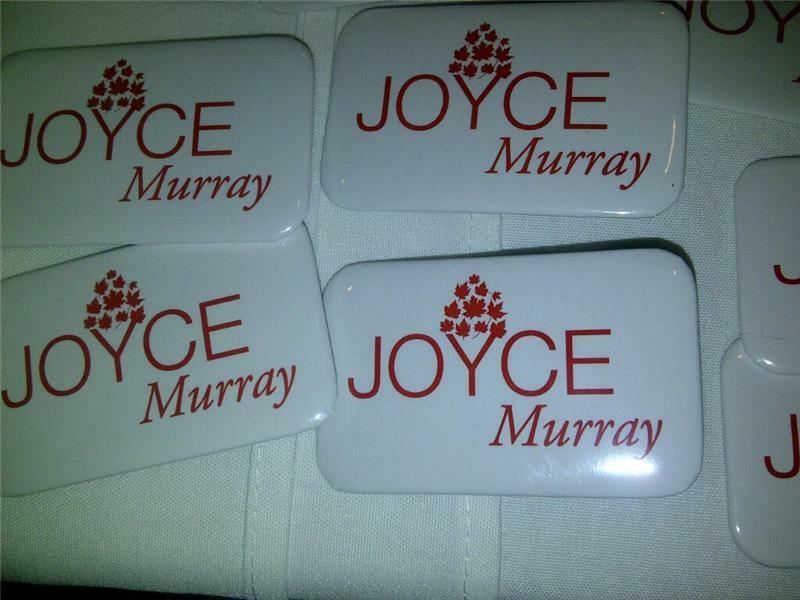 Joyce Murray's buttons on display outside the hall earlier today. Large group of supporters and live band welcomes Murray on stage. Murray: running for leader to defeat Stephen Harper, repair Canadian democracy, and realize vision of a sustainable society. IMO Regurgitation of 'orange crush'... Mulcair is smiling and setting aside a special place for Murray in cabinet. Supporters seem to b out of sync...stuttered, shouts of encouragement and confused clapping. Murray knows how to b patronizing to Indigenous people already & is only 1st generation, so kudos! U fit well with NDP or Cons. Good luck!